What's up guys? So, I have been looking around for cams lately. Of course the first question is what's the purpose and setup of the car. I am wanting a bump over stock hp. Nothing too insane. It's my track car that hardly sees the street. Also considering if a set of pistons would be worth the investment or if a TRD .08 gasket would be enough to make some power paired with a bigger cam. It seems like there's a ton of options for 16v cams, but not too many options for the 20v. So what would be a good option for a 20v cam? Whether you've got 16, 20, or 5 billion valves: Pon Cams seem to be the best bet. +3 for the pon cams. Supposedly they work with stock cam gears. 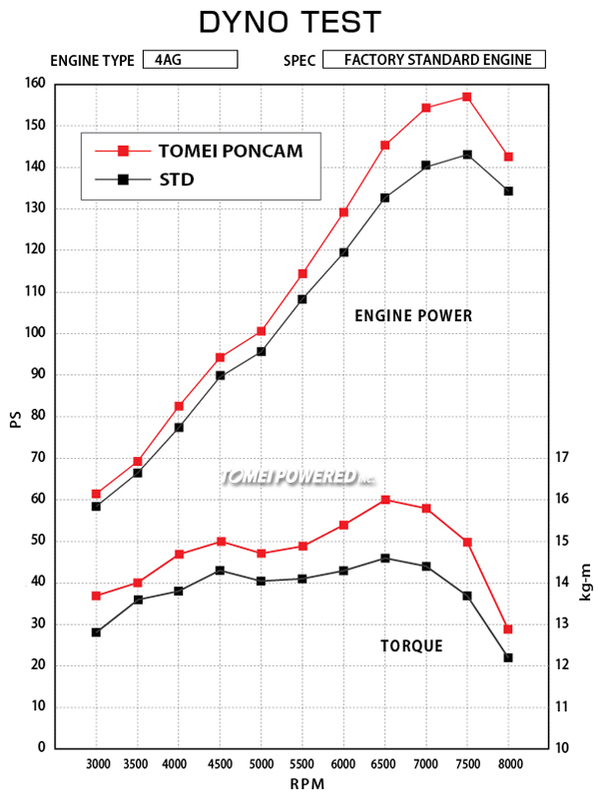 This graph below shows the difference with those cams on an otherwise stock engine. The best part is you gain hp/tq. pretty much everywhere. If I can ever find a blacktop reasonably priced locally I'll be getting these. Cool. Thanks for the input guys, I was considering the tomei Pon cams. I was unsure if the 264 was big enough to make any power over stock. But, if they are the cam that works without swapping out the shims and whole valve train then I will probably go with them. There's only a couple other options and a couple aren't company's I have ever heard of. I think they are Aus/Nz company's. I didn't see any cams on the bc website, but maybe they used to make them. What are the specs? Edit: These are 16v cams, haven't seen them for 20v.